In the late 1990s, I worked with the strange and wonderful Word.com to design and develop SiSSYFiGHT 2000, a multiplayer game inspired by classical game theory, the outsider art of Henry Darger, and everyone's horrible childhoods. You play a little girl in a social conflict on a playground, trying to reduce the self-esteem of the other girls and be one of the two survivors. The success of your actions depends on what others do: teasing, for example, only works if two or more players all tease the same target together. It's an ugly game. SiSSYFiGHT 2000 was a pioneer in many ways. 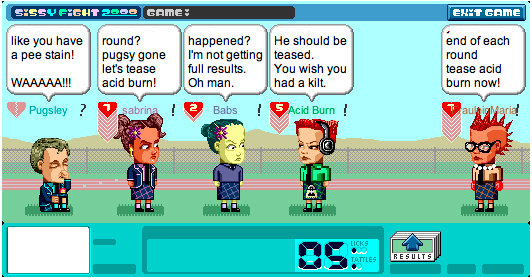 It was the first browser-based game with real-time chat; a feminist intervention into the boy's club of gaming culture; an adopter of retro game aesthetics long before "indie games" was a thing. In 2015, Ranjit Bhatnagar, Naomi Clark and I kickstarted and re-launched the game to work in contemporary browsers. Copyright © 2016 Eric Zimmerman. All Rights Reserved.